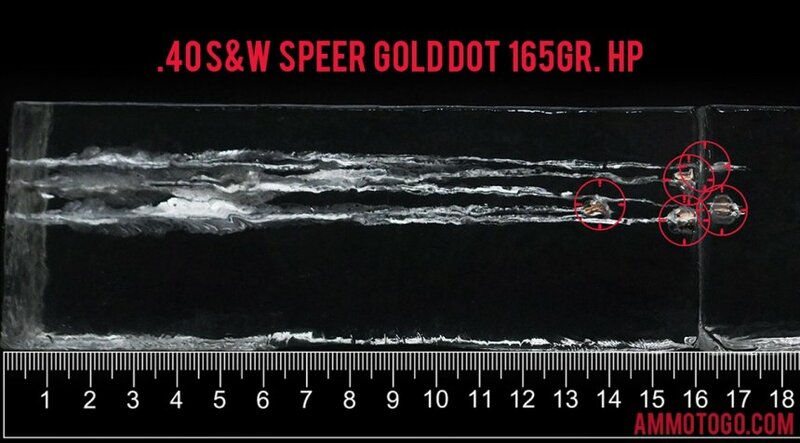 Speer’s Law Enforcement ammunition is designed to give professionals the barrier blind performance they can’t do without to stay safer while on duty. 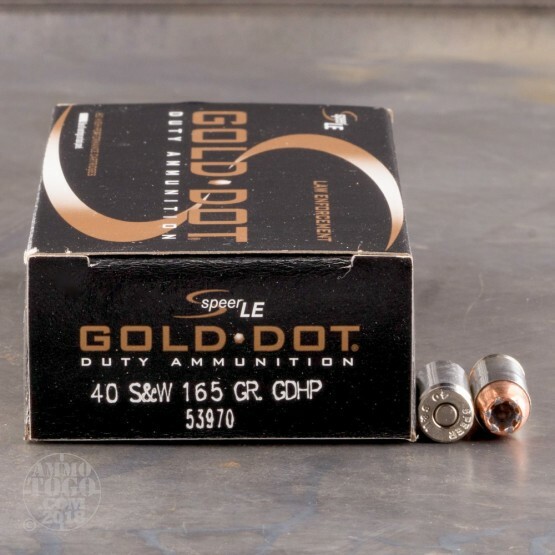 This 40 S&W cartridge’s 165 grain Gold Dot projectile manages that because it is core and jacket are bonded together electrochemically, making them nigh inseparable as the bullet passes through a variety of urban barriers. 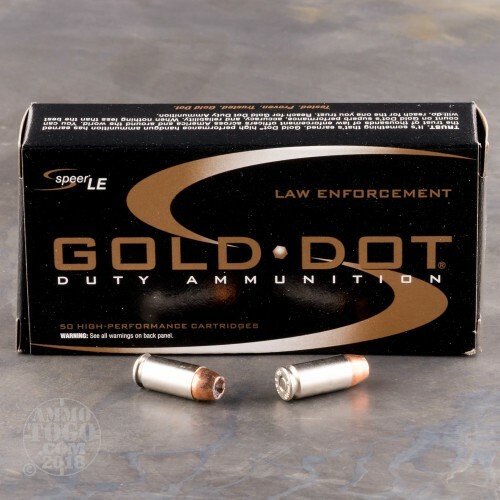 This bullet burrows through heavy clothing, wall board, and plywood without losing virtually any of its weight -- even safety glass hardly puts a damper on a Gold Dot’s superior weight retention. The Gold Dot is formed over the course of a two-stage process. In the first, the width to which it can expand is established. In the second, the rate of its expansion is predetermined. 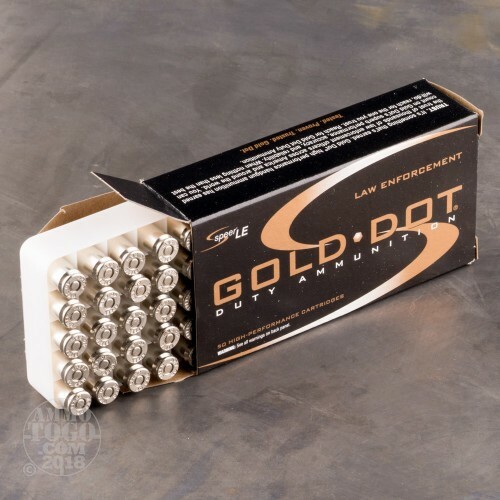 As the result a Gold Dot dependably delivers lethal terminal performance that you can bank on to keep your hide in one piece, just like it belongs. Furthermore, because this bullet’s jacket was formed one molecule at a time it’s intensely concentric for assured straight flight. This cartridge features a nickel plated brass casing. Nickel reduces friction to ensure uninterrupted cycling, and also resists corrosion so that exposure to atmospheric moisture won’t compromise your self-defense load’s potency. 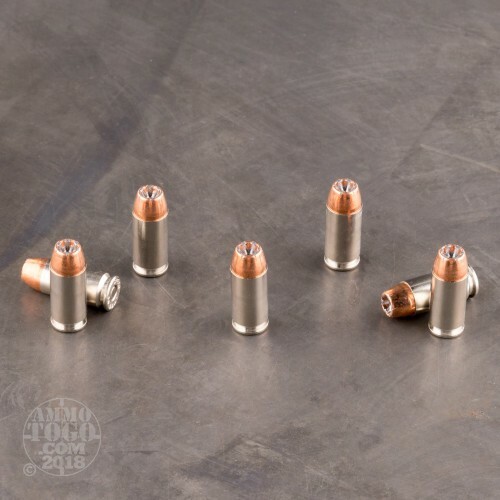 Expansion Diameter Compared to All 40 Smith & Wesson Ammo Tested MIN 0.39" MEDIAN 0.65" THIS AMMO 0.62" U.S. dime MAX 0.89"